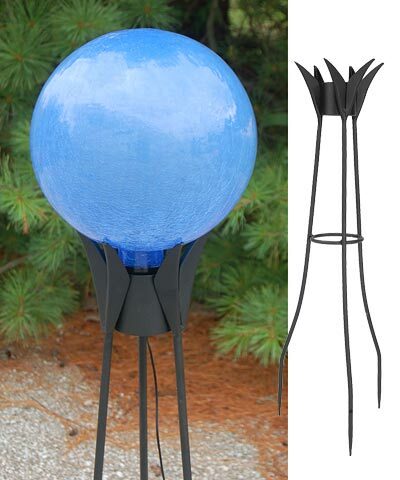 Bring a heavenly adornment to your backyard using the Achla Light Blue Garden Celestial Solar Gazing Globe with Stand. This dramatic orb continues the centuries old tradition of adorning your yard with a gazing globe, while its included stand makes placement simple. The soft blue color of this ball evokes the daytime sky, while a crackled finish throughout it lends extra style and texture to your garden. A mirrored finish on the interior of the piece adds to its allure and folklore, and also showcases the white LED inside it. This wonderful diode illuminates in the evening, bringing a remarkable look to the orb, without requiring any electricity. The included solar panel powers the LED, and the included stake offers versatility in placing it. The pivoting head of the stake allows you to angle the solar panel as needed per season, and the globe's 45" long cord brings power to the integrated, lithium ion battery. This keeps the globe illuminated for up to 8 hours per night, showcasing the unique, crackle pattern of the hand blown orb. Display the ball in the included, Achla Black Crown In-Ground Gazing Ball Stand, nestling it nicely in your landscaping. Celebrate both day and night in a fun way with this Light Blue Garden Celestial Solar Gazing Globe with Stand. Qty 1 Achla Garden Celestial Solar Gazing Globe, Light Blue, 10" dia. Qty 1 Achla Crown In-Ground Gazing Ball Stand, Black, 33"
Achla Crown In-Ground Gazing Ball Stand, Black, 33"
Achla Garden Gazing Globe, Blue Crackle, 12" dia. Rome Stainless Steel Banded Sphere, 18" dia.